Best value Modification available on the market. PERIOD ! The Highest Quality Brands available. Realistic performance without the worry of warranty issues !. Fiesta St150 Power upgrades do not get any easier than this simple 160bhp kit,it is a complete solution that delivers a much more drivable vehicle. Both power and torque increase with the use of these now industry standard upgrades. The Flex Pipe is the key ! a must have that removes the 42mm exhaust restriction !! The Pumaspeed Workshop team are ready to fit the Fiesta ST150 Power Upgrade Kit ST160 in our Head Office located here. We estimate the labour time to be approximately 0.66 hour(s) costing £51.48 inc VAT. Therefore making parts and labour a total cost £296.98 (inc. VAT). 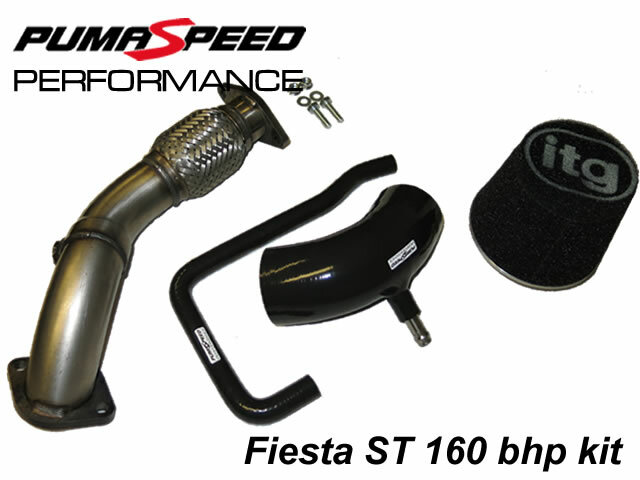 Pumaspeed have a specialist distribution team that can dispatch the Fiesta ST150 Power Upgrade Kit ST160 to any destination worldwide.